Of the two vineyards in the higher altitude north-eastern corner of the Watervale subregion, ‘Rockwood’, with its hard red rock and variable soils, is viticulturally the more challenging. 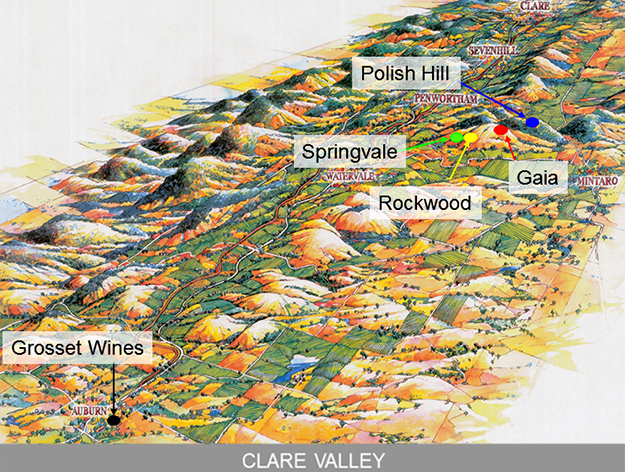 In 2000 a detailed geological survey of the Rockwood vineyard was conducted. It highlighted three sections suitable for planting vines. From the eastern boundary of the property, a very stony section rated as ‘marginal’ for viticulture, is planted to two different clones of the Italian variety, Fiano, used in the making of Apiana. Some fifty metres to the west, a narrow (300 metre by 22 metre / 15 rows wide) corridor of hard red rock (a bit like slate) with a poor orange/red loam for topsoil which Jeffrey Grosset believed would be suitable for growing Riesling fruit. This is the source of ‘Alea’ after the Greek goddess of wisdom, courage and agriculture, Athena Alea (Athena the Exalted). Grosset noticed that the flavour in the first grapes produced (six years later) reminded him of some of the great European Rieslings which were not completely dry. Inspired by this and unfazed by the low acceptance of this style in Australia at the time, Grosset made the first ‘Alea’, a wine that in his opinion, best reflects the vineyard.